The Art Institute of California in San Diego is now offering classes to the public in a new program called GetCreative! I sat in on the launch of the program a few weekends ago, taking a class in my area of interest: Culinary Arts. to a stand mixer much easier. I’m not one to be up on hipster vernacular (80s girl here still stuck on “duh,” “stoked,” and “awesome”), but let me just say this: red velvet cake has been my jam since I first tasted my mother’s Christmastime red cake when I was a wee child (I think I've been watching too much of the Starz series, "Outlander" as I'm thinking with a Scottish accent these days!). The cake is seriously yum and it was a tradition we all looked forward to every year. And, uh, no cream cheese, if you please, it was topped with a fluffy whipped frosting (known as "ermine frosting") which mom's recipe book called "snowdrift" frosting. I love my mother’s red velvet cake to this day. It’s a tender, tangy, stunning, dramatic cake that I’ve written about before. Nonetheless, I’m always looking to see how other people make red velvet just in case there’s a tidbit I can take from their version to make our family’s better. Learning, growing, experimenting is what life is all about. No matter our area of expertise, the moment you feel you have nothing left to learn is the moment your work starts to suffer. Closed off from the universal creative well, you get stuck in a rut, rehashing what you already know and the work becomes stagnant. It’s why I love to spend time in the kitchen cooking with family and friends (like here, here and here), why I love to collaborate with other photographers both on set and running workshops, dissecting how other photographer’s tackle similar projects, why I am always reading other food and design blogs, looking at other artists work, reading how other writers structure their words, and when time and finances allow, taking workshops from seasoned professionals just as committed to sharing and learning as I am. Three culinary students (two of them shown here, center) volunteered to give up their Saturday to assist so that we taking the class didn't have to spend time washing and cleaning up after ourselves. They were super helpful in answering questions and demonstrating, too, when chef was busy helping another table. At the start of the month, I was invited to take a GetCreative! 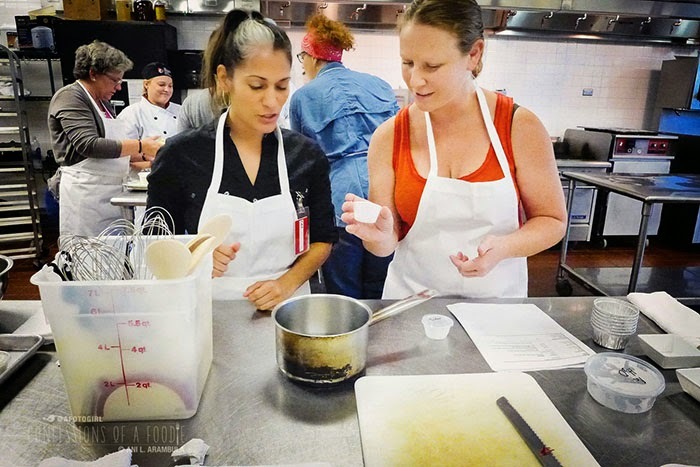 Culinary Class at the San Diego campus of the Art Institute of California. I was beyond stoked to get the invitation. Looking over the course schedule and comparing it to my availability, it just so happened that the day I could attend was the very first GetCreative! 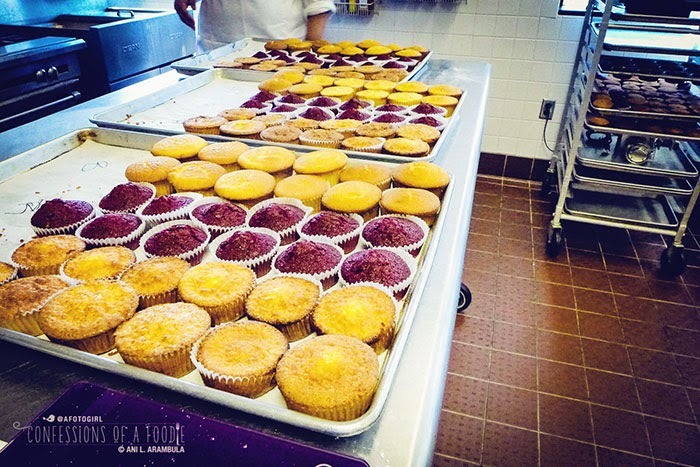 course on campus: Red Velvet Cupcakes and More! My sister takes her turn sifting. Early in the week of the Saturday workshop, I was contacted again and told that I could bring a guest. I immediately thought of my youngest sister since baking is her thing and I honestly could see her going to culinary school and becoming a pastry chef. She was as excited – if not more so – to check out the class as I was. 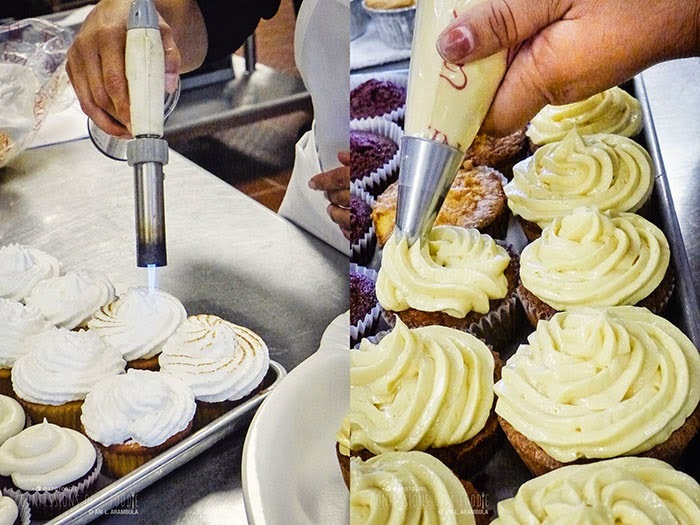 Chef demonstrating how to fill a pastry bag and how to control flow to fill cupcake liners. Then it was our turn. Look at that gorgeous red! Dressed in long pants, long sleeves and closed toe shoes as instructed, we showed up bright and early and waited in the lobby until the rest of the attendees arrived. 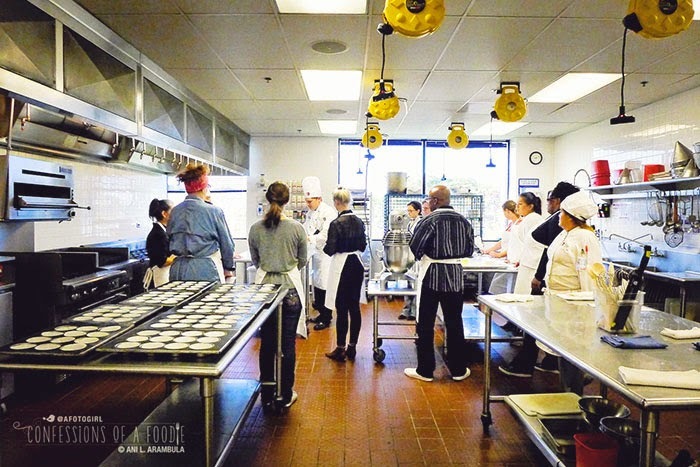 Once we were all assembled, we were led upstairs to the culinary wing of the main building and entered what would be our classroom for the day: a beautiful, restaurant-sized professional kitchen with 6 workstations and a demo table. 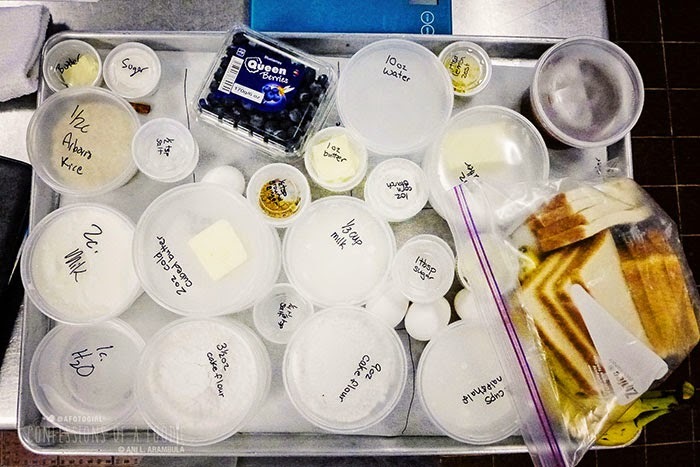 The culinary arts students prepped all the ingredients for the four desserts that we'd be hands-on learning, labeled and separated by lines drawn on the parchment liners. Each workstation had a complete tray. 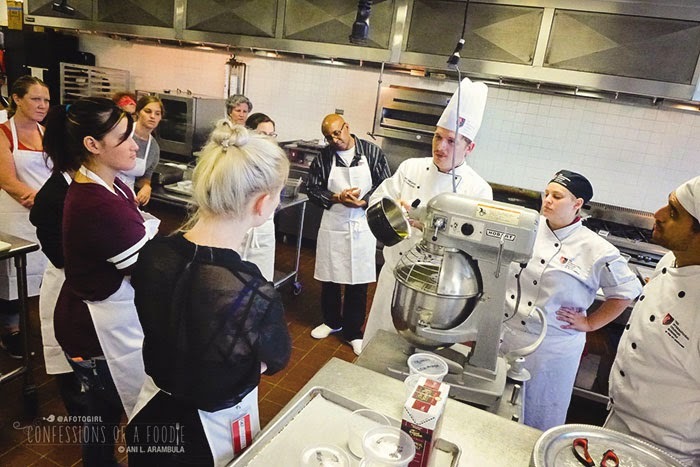 We were introduced to Chef Shawn Matijevich, Chef Instructor at the Culinary School for a year now having previously been a Culinary Arts instructor with Grossmont Unified School District as well as a private chef and a Culinary Specialist in the U.S. Navy. Chef Shawn was a good instructor. I liked him a lot. I found him to be really energetic, knowledgeable and genuinely happy to be teaching this class. And away we go! Our team cooking marathon begins. First up: Arborio Rice Pudding. Mom makes a pretty killer rice pudding. We call it arroz con leche. It has tons of cinnamon, no vanilla bean, lots of white sugar and uses evaporated milk. It's sinfully delicious. This version, using the arborio rice – the same rice used for Italian risotto – was super creamy. A result of having to sit and stir and babysit it the entire time the rice was cooking. I was on that task. Yuppers. Fine. Seriously, this was good rice pudding. Much less sweet than what I'm used to. I think I still prefer mom's cinnamony version but on those days I want the creamy goodness with less guilt, this will definitely fit that bill. "A lot of the instructors are excited about teaching these one-off workshops (which take place in the evenings and on weekends and are in addition to their normal classes) because they can teach without having to worry about grading," said John Sexton, GetCreative! Program Coordinator on the SD campus. Attendees were divided into groups of 4 to a workstation and after introducing ourselves and taking a brief look at the day's agenda, Chef Shawn jumped right into demonstrating how to make a red velvet batter, the importance of properly sifting, how to use a pastry bag, and shared some history (did you know that red velvet cake went nationwide during the Great Depression when an extract company was trying to push its red food coloring?). 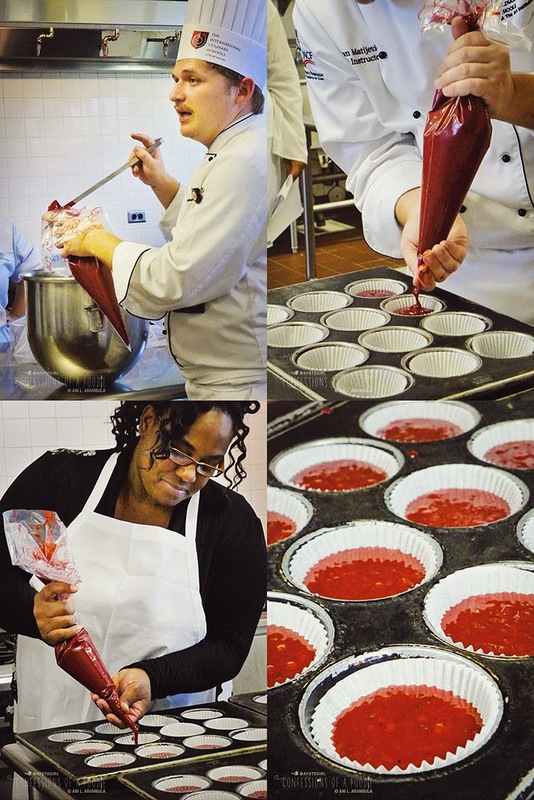 From there, students got hands-on time mastering the pastry bag method of filling cupcake molds. 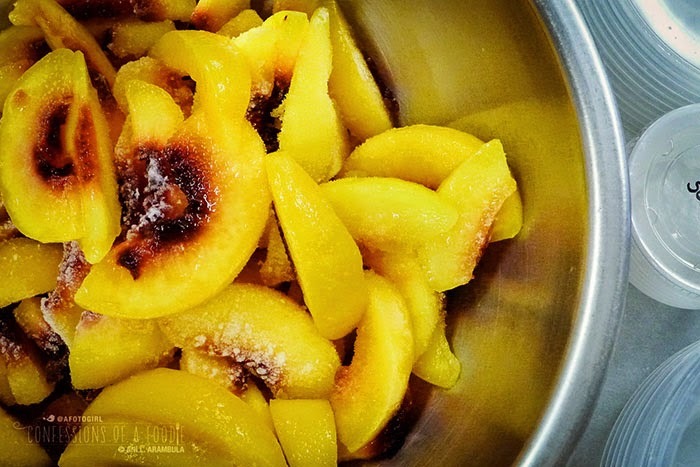 I didn't get a chance to try the peach cobbler and since I was busy babysitting the rice pudding, I also didn't get to see most of the prep. 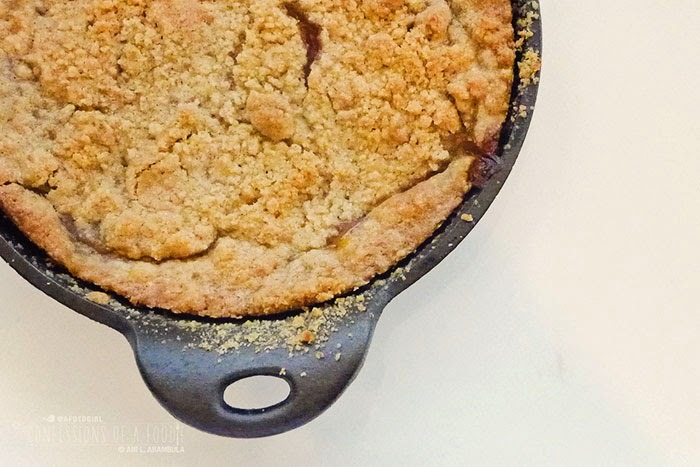 I thought it came out pretty in these cute little cast iron skillets. I gave the cobbler I brought home to my grandmother who said it was scrumptious – in Spanish of course. Oh! Yeah, there's also a ton of goodies to take home to share with family and friends. I forgot our containers for takeaway. So did most of the class. Luckily, some takeout boxes were located so we had plenty of containers to take home lots of goodies. 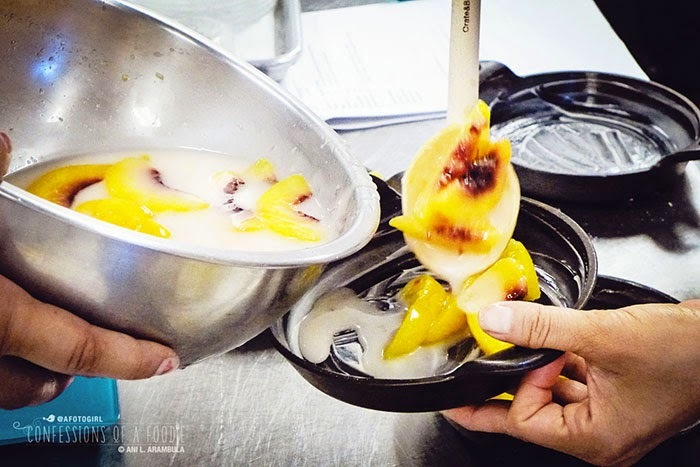 Teams would each have four recipes to produce: a peach cobbler, a blueberry quick bread, sweet rice pudding and Chef's take on a banana bread pudding with caramel. It was left up to the teams whether to tackle each recipe as a group or assign a recipe to each team member. Our team, as did most of the others, opted for the team approach much to the disappointment of both my sister and I. Having grown up in a family were gatherings are always food-centric, we are both so particular about how to do things and are very comfortable in the kitchen. Our other two team members were not so we took one for the team. 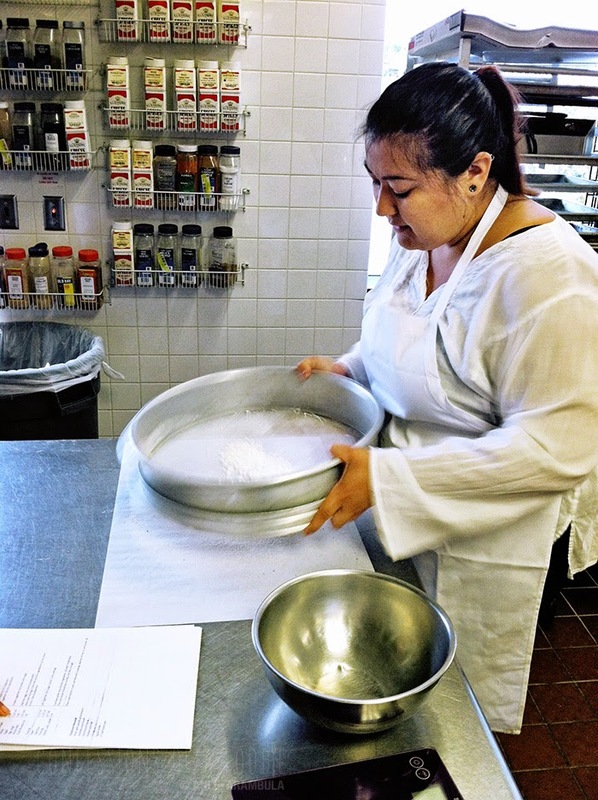 Learning the difference between French and Italian meringue. We also had demonstrations on making meringue frosting, meringue for a flourless chocolate cake, pastry cream, filling cupcakes with said cream and cupcake decorating (two additional types of cupcakes were made prior to the start of class due to time constraints so as to give us as more decorating experience during the four hour workshop). to practice our piping skills. 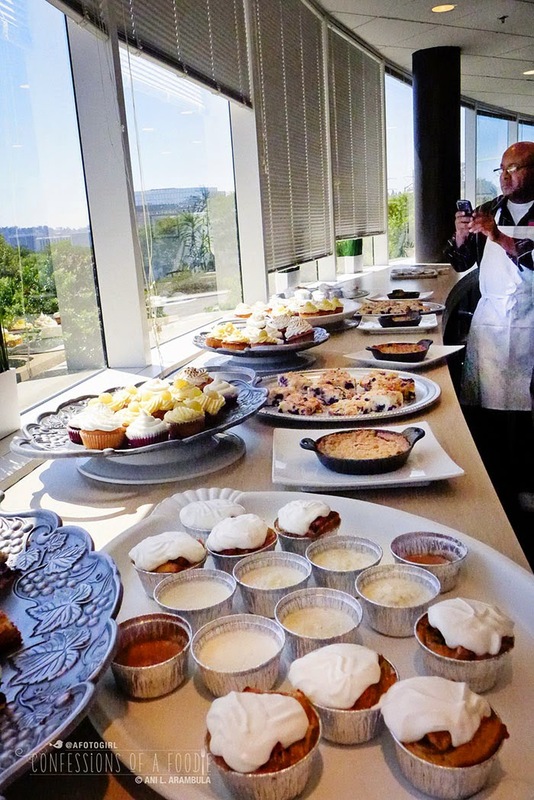 As our creations came out of the oven and we finished the decorating, chef brought out display platters and pedestals to place our creations on and marched us out to The Palette, the student run cafe that apparently is closed on the weekends. He lined the platters up on the counter and gave us his closing thoughts. He wanted us to see the fruits of our collective labor in an Instagram-friendly environment. I thought that was a great way to end our day's adventure. 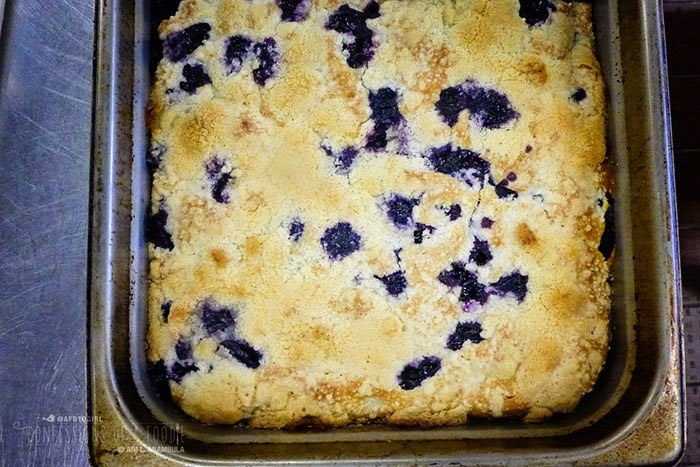 Cake flour creates a more tender crumb. 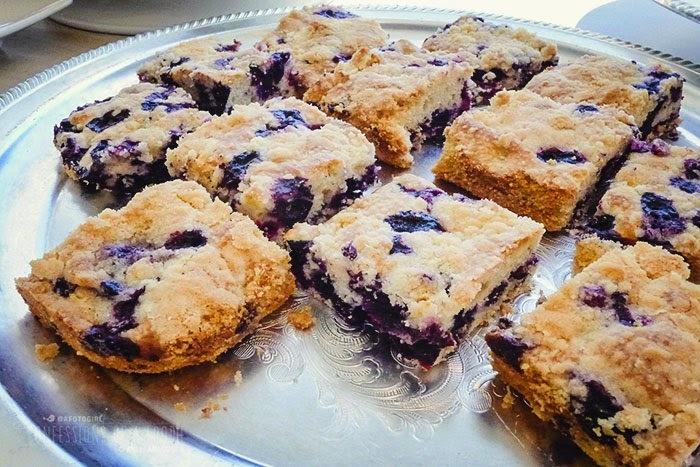 To help combat dry cakes, use vegetable oil instead of butter. Don't over-mix cake batter. Doing so will develop the gluten and make cakes tough. If you need a more stable meringue, use an Italian meringue which cooks the sugar as a simple syrup. 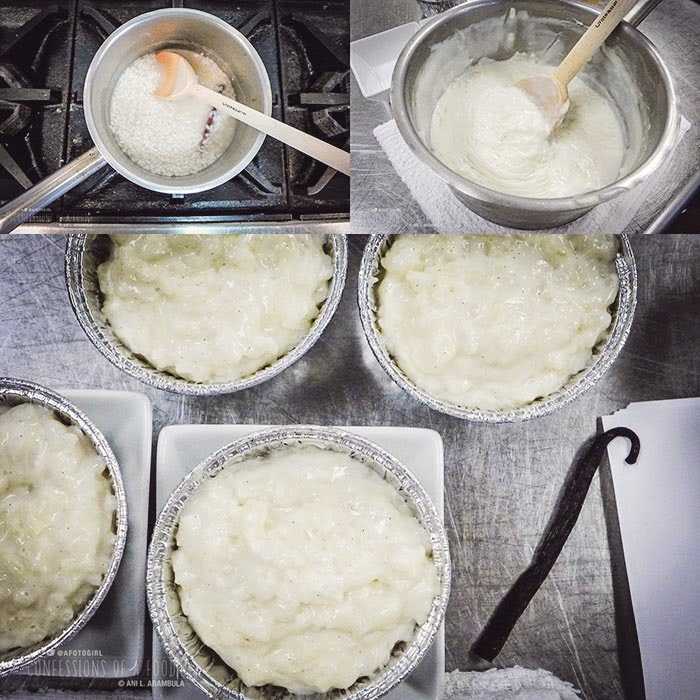 While slowly adding the cooled simple syrup to the egg whites while whipping, the egg whites are gently cooked and over-whipping is nearly impossible. (Over-whipping French meringue will cause the whipped eggs to break). Don't get hung up on time when it comes to baking. Learn to rely on your sense of smell and touch: you should first be able to smell the cake and second, a cake that springs back when gently touched is ready to be removed from the oven. Sexton, the program coordinator, told me that for years, people having been asking if the Art Institute offered classes or workshops to non-institute students. They realized that there was a demand for classes that would feed community interests. Currently, Philadelphia and San Diego are the campuses testing out the GetCreative! program to see how it goes over in the communities they serve. San Diego is the first to get the program underway. Special: Classes are 50% off if you enroll by October 31. See the San Diego campus course schedule here. 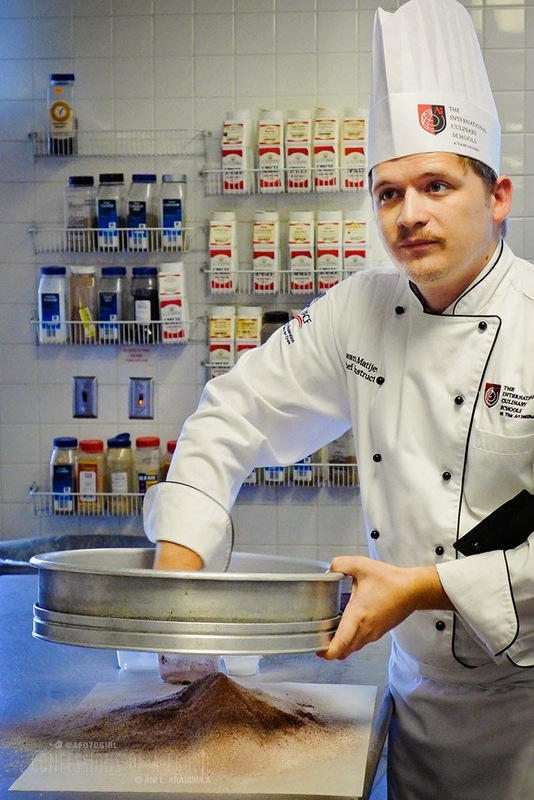 Chef Shawn recommends weighing ingredients rather than measuring volume for more accurate and predictable results. "Digital scales in the kitchen are a must," he emphasized. That said, this recipe is measured in weight, not volume. 1. Preheat oven to 375 degrees Fahrenheit. Butter a 9x12 cake (or lasagna) pan. 3. Cream together the butter and sugar. Add the egg, mix until incorporated. 4. Add a third of the dry ingredients to the butter mixture. Mix until incorporated then add ⅓ of the milk and mix well. Continue alternating and mixing after each addition until all the flour and milk is incorporated. 6. To make the topping, sift together the sugar, flour and nutmeg. Cut the butter into the dry ingredients using a pastry cutter, two knives or your fingers (if using your hands, work quickly so as to not soften the butter). The end result should be crumbly and sandy not like a dough. 7. Place the cake batter in the pan, sprinkle with topping and bake for 35 minutes or until topping is golden. Recipe courtesy of Chef Shawn Matijevich, International Culinary School at the Art Institute of California San Diego. Reprinted with permission. Until next time friends! Happy baking. 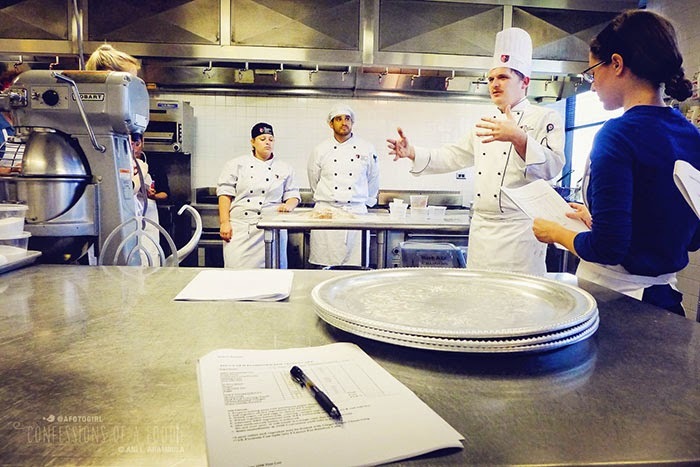 Disclosure: I was contacted by the International Culinary School at the Art Institute of California San Diego and invited to take a culinary class of my choosing. I was not asked to do a post or compensated other than the comp'd class for myself and my sister for this editorial write-up. As always, all opinions are my own.